Guys, it's official. I made something off my 2017 Make Nine list! It's a miracle! 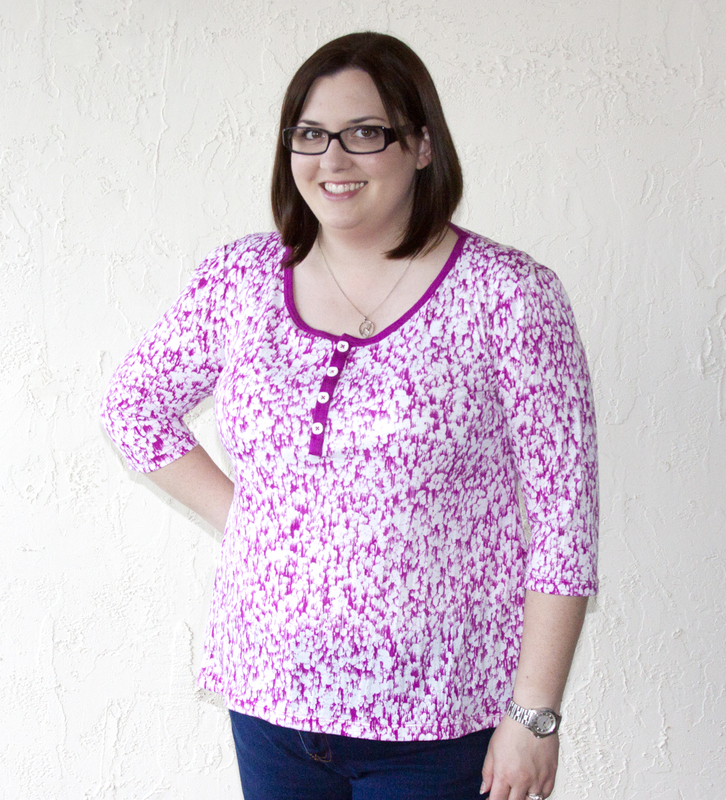 This is the Hepburn Henley by Winter Wear Designs - a completely new-to-me indie pattern company. 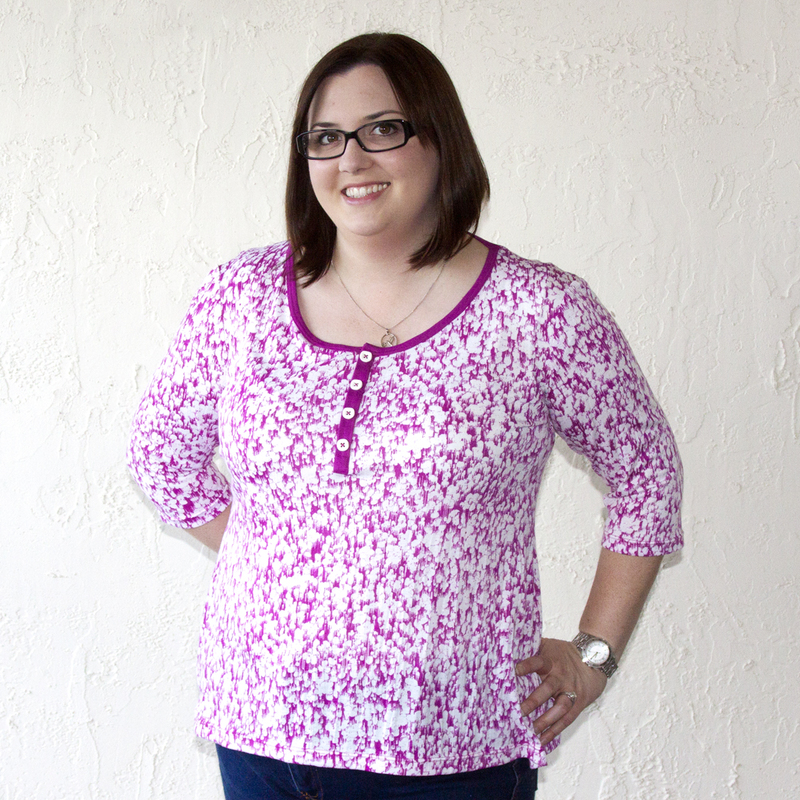 I saw Abby Dabbles' tester version on the Curvy Sewing Collective Flickr board back in October and I was in love. I waited on buying the pattern since I knew I couldn't make it up at the time, but then they had a Black Friday Sale and I caved, lol. Since this was already printed out I decided to just bite the bullet and make it up :) I picked a size 14/16 by my measurements on the size chart, traced it off, and hit the stash to pick some fabric. I picked this unknown jersey from my stash for this top. I grabbed it at the major Sewing Studio sale a year or so ago - it was a designer remnant, so it's content is a mystery but there's a heavy dose of polyester in it (enough that it refuses to press). 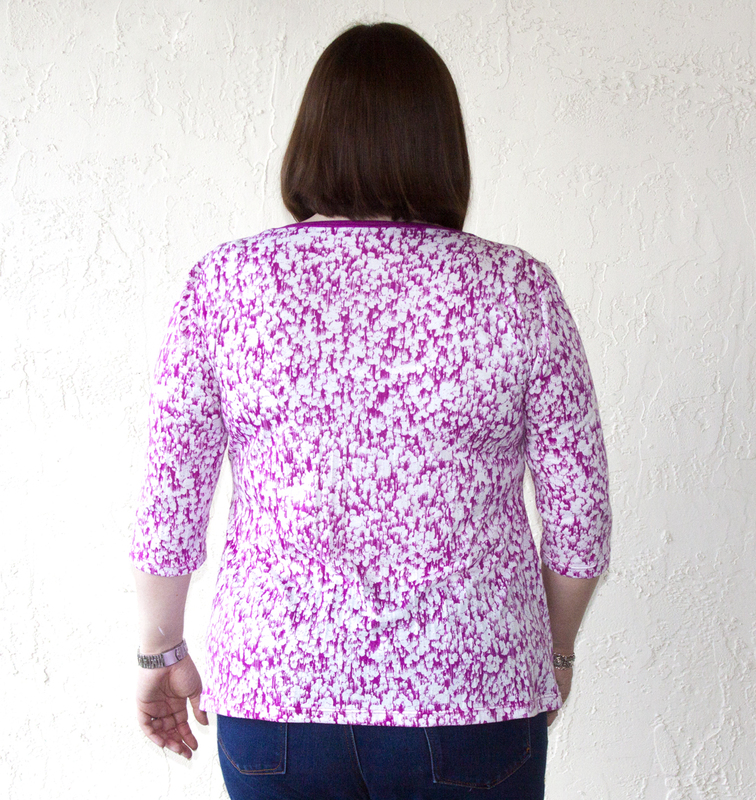 It's a cool "melting blobs" print in white and fuchsia. When deciding on something for the neckband and placket I came across scraps of the fuchsia interlock I used for my Classy Parisian Top a few years ago and it was a perfect match - talk about meant to be! I cut out the pieces and set to work. 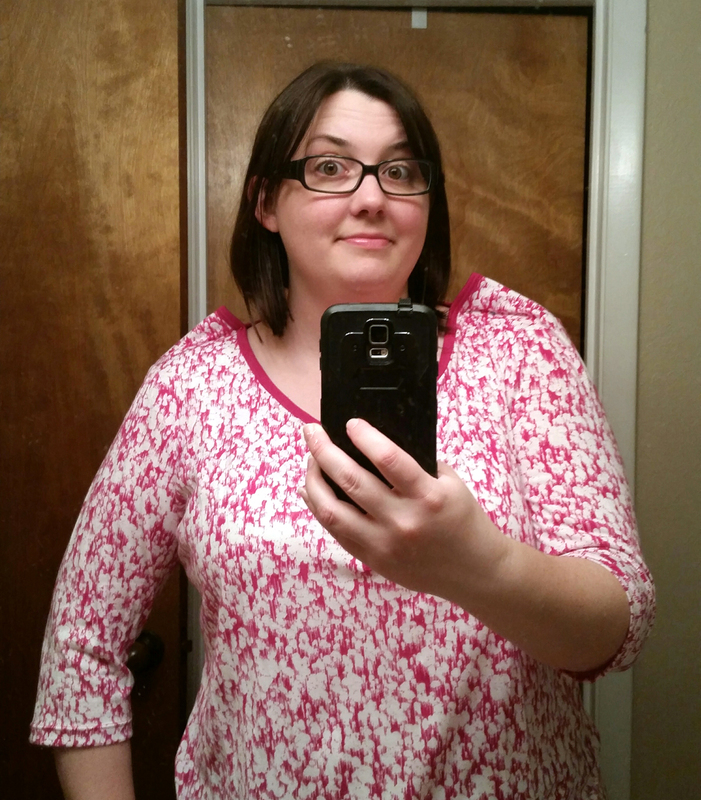 The real attraction to this pattern is (obviously) the neckline. The pattern gives options of a full henley with button placket, a faux henley, or just a plain t-shirt. I went with the full blown henley since that was made me get the pattern - I haven't seen anyone else make patterns like this in knits, have you? You also have the choice of 3 sleeve lengths. I went with the 3/4 option. This is my first ever button placket like this, and it was not without its hardships (which I'll address later in this post). I got there in the end, and I have to admit it looks really good in person. By the time it came to doing buttons I was so frustrated that I just sewed them through both sides of the placket, but rest assured the placket is functional other than that there are no buttonholes. 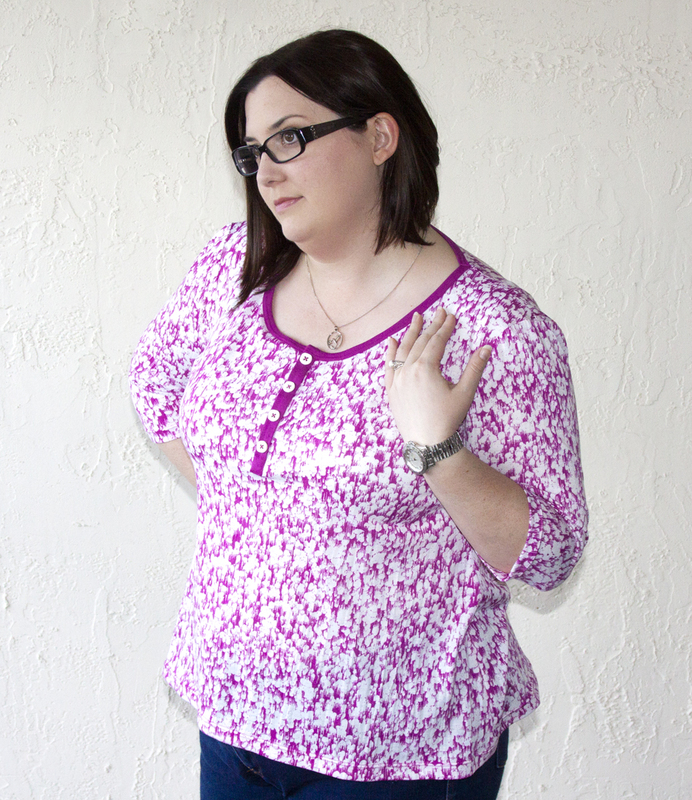 The shirt was heavily adjusted for photographic decency here. The neckline was ginormous. It was wide, it was deep, it was loose. Even how I'm standing in the photo, I could look down my entire shirt. It was really bad, and I was pretty ticked off, lol. This was the most difficult neckline I've ever done, it turned out great (after having to "wing it" several times), and it turns out too big in the least save-able way. At first I had just accepted it was a failure and the most complicated sleep shirt I'd ever made. I hung it up and walked away. A few days later the answer suddenly came to me out of the blue - I could take it up at the shoulder! Thanks to all my alterations experiences, I knew this was possible. I pinched up what I needed to remove, marked it, then stitched a new shoulder seam. It's not a perfect fix - the neckband which was meant to be continuous all the way around now has 2 seams, also the sleeve cap itself had to be adjusted since I was left with very pointed shoulders from angling into the actual seam there. 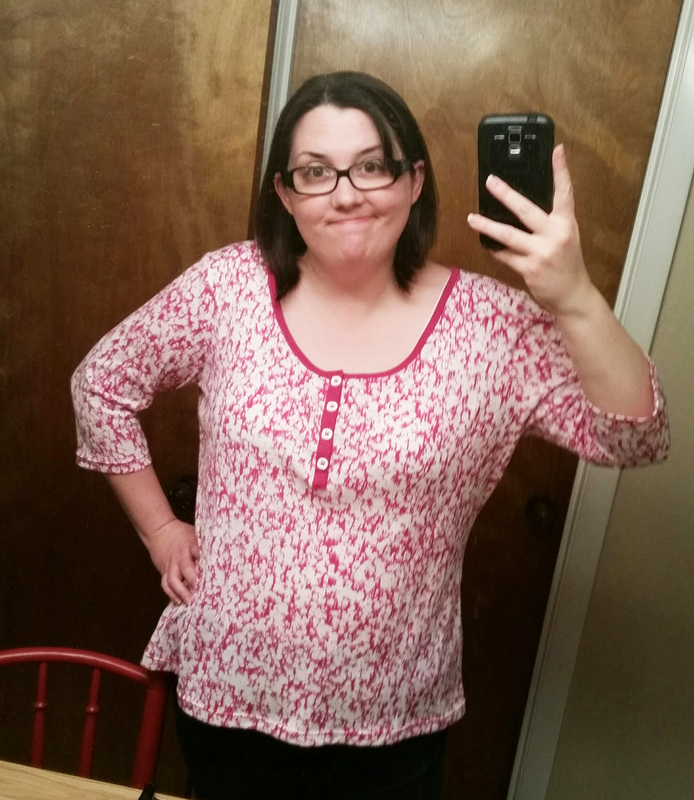 Happily this worked and fixed almost all of my issues with the fit (the loose neck, the low arm holes, etc), so I'm pretty sure that going down a size or maybe even 2 will do the trick in the future (as well as shortening the neck band piece). Once the neck was wearable, I focused on fixing the saggy body. I like a loose fit, but this was just plain dumpy looking. For me I find that the key to loose styles is that they need to be snug at the bust and just below the bust to highlight my narrowest area, then drape away as much as you p;lease over the tummy. If this bust-snugging doesn't happen, I look kind of like a lego brick. Not good. So I took 1.25" off each side starting at my upper arm until just past my bust, then quickly angled back out to the original seam. So much better! This is how the neck band looks after my alteration. Not perfect, but certainly not obvious in the slightest to anyone who doesn't sew. It just burns my biscuit to think about it though. Ugh. And for the record No - I did not over stretch the neck band. I've sewn many a t-shirt and sewed this just the same. 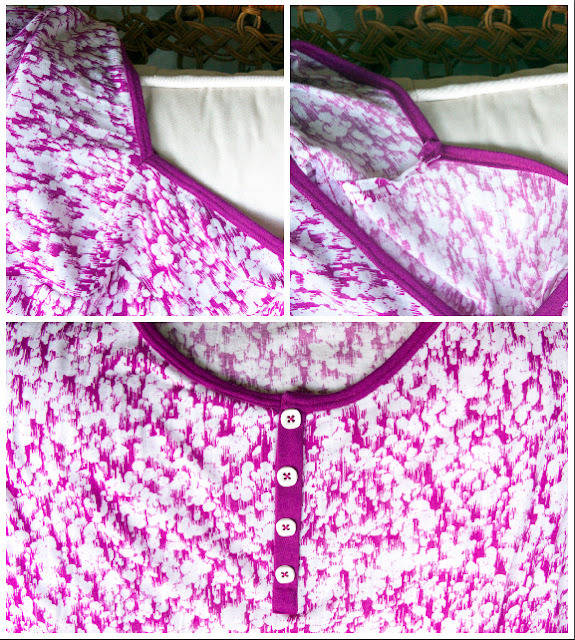 I also absolutely could not do the angled edge she shows in the pattern at the placket. With how the photo instructions show you to do it, I ended up sewing the band on upside down to what it actually needed in some way and too far in to actually wrap the placket piece - this makes more sense if you've sewn it - but when I kept comparing my project to the photos and the diagrams my neckband piece was sewn in the same way. I still have no idea what happened here. Personally, I work much better with just written out instructions and maybe a few drawn diagrams - I have a very hard time with actual photos (anyone else like this?) so maybe it was just my brain not wanting to work that way. Again I was able to get there in the end (though my neck band is just barely enclosed and is squared off because that's all I could figure out to do), but holy crap was that frustrating to deal with at the time. Most. Difficult. Neckline. Ever. And most of that for me was due to the instruction format. Here is how the new shoulder seam looks on the inside and outside. And looks at that pretty placket :) The buttons were some vintage ones I had in my stash and I think they look pretty cool with the design on the fabric. I do kind of wish the placket opened, but the instructions say you can add the buttonholes before finishing the placket or after, and not feeling like changing everything a completely different machine to set up the button holer, I opted to make them at the end. Bad decision. After 2 total failures caused by the machine not liking the bulk at the bottom of the placket that I was trying to fold out of the way, I threw in the towel. At that time I thought it was a goner anyway, so I couldn't be bothered. This is also the first time I ever twin needle stitched on top of the actual neck band - every other pattern I've done has you stitch below it, or even straddling that seam. This one you stitch right on top and near the bottom edge. It looks nice, and everything is completely enclosed inside, but man was that a pain in the rear. In the end I'm happy to have a wearable top, and I'm glad I tried something new :) And I sewed something from my Make Nine list! Oh my gosh, you guys! Total miracle right there (and one that kept on going - check back soon! ).